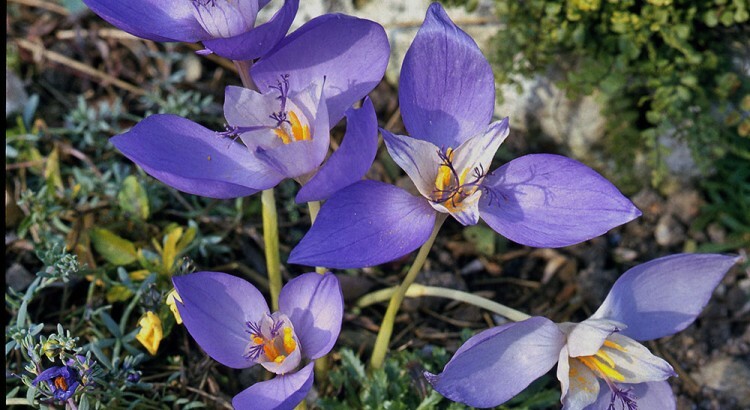 This must rank as one of the most unusual and exotic of all Crocus species. It is one of the last of all the plants to flower in my garden, perhaps just preceding Galanthus reginae-olgae this year, blooming anytime from September into October (according to the season). I would always plant this species, native to the Romanian Carpathian Mountains, in pride of position. Although in nature it inhabits both open and woodland conditions, I have it planted in a cool position in a soil rich in leaf mould and protected by a few carefully positioned logs. The flowers are large and consist of delicate, long-tubed, lilac to light purple-coloured petals. The three inner segments of the flower are conspicuously shorter than the three outer ones. It also has a distinct lilac-coloured, finely divided stigma. As with many blue or purple-flowering crocus species, this one produces some fine albinos including the very attractive C. banaticus ‘Snowdrift’. In terms of propagation, established clumps of corms can be lifted and divided when dormant, whilst propagation from seed is also possible if care is taken to look out for the maturing seed capsules.